7.vociferous partisans, quick to take offence. 8.England sixty eight for none at lunch. 1. 'What sort o battin dat man? as the batting and the crowd restless. fe watch dis foolishness? Cho! but fail to convince even myself. to conceal a 13.blushing nationality. Brown, S. 'Test Match Sabina Park' in A World of Poetry. Edited by Mark McWatt and Hazel Simmonds McDonald. Pearson Education Ltd, 2005. The persona, a white male, proudly enters Sabina Park to watch a cricket match between England and the West Indies. The persona notices that the game is slow and that the crowd is not reacting well. He is, in fact, initially shocked (www.bulbsoup.com) that there is a crowd at all because this is usually not the case at Lords. By lunch, England is sixty eight for none, and the crowd gets abusive. They even state that maybe they should borrow Lawrence Rowe. The persona tries to explain the reason behind the slow pace of the British side, but fails to convince even himself. His embarrassment at England's performance has him eventually skulking out of the venue. Stanza 2, lines 6-7: This question reveals that, despite the fact that cricket is a popular sport in England, the venues (www.bulbsoup.com) for the matches are not crowded. This question could also point to the fact that Sabina Park was very crowded. Stanza 4, lines 16-18: These questions imply that the West Indian crowd's level of frustration has escalated. The allusion to Lawrence Rowe, a very colourful and successful West Indian cricketer, emphasizes the fact that the match is slow and boring. To 'boycott' is to abstain from, or to stop, doing something. Therefore, the persona is being sarcastic because excitement is a good thing. People usually boycott for something negative, therefore the persona is, again, highlighting the slow and boring pace of the cricket match. ​​The word 'boycott', is a play on words. It literally refers abstaining from excitement, along with referencing the cricket player Geoff Boycott. the second pun is on the word 'amiss'. this literally means that an important element is missing in the match, but it is also referencing the cricket player Dennis Amiss. This pun is particularly clever because the poet manages to manipulate the words to indicate that England is missing these two strong cricketers, or cricketers with their skill, which is why they are playing a slow game. 'This word means to walk proudly. 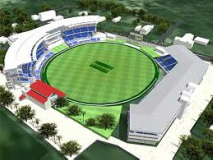 It emphasizes the fact that the persona is proudly walking into Sabina Park. The persona is jolted by the fact that the match is going slowly. The word 'amiss' implies wrong, the game should not be going so slowly. Vociferous means to be very noisy and clamorous, while patisan is a person who shows biased, emotional allegiance. Therefore, the West Indian crowd was extremely noisy in their support of their team. They were also very unappreciative of the slow pace of the match. The purpose of the wicket is to 'out' the opposing side. Therefore, no 'outing' is occurring, the wickets are standing. Everything about the match is going slowly. This implies a sticky, or awkward situation. It highlights England's situation. Skulking implies (www.bulbsoup.com) hiding in shame, and tarnished means tainted. Therefore, the proud Englishman is now embarrassed, and the rosette of his skin is making him stand out. Initially this was a very good thing, but now it is a disadvantage. There are two distinct voices in this poem. The English man's and the West Indian's. The mood of the poem is tense embarrassment. The tone of the poem is one of frustration and annoyance (West Indian), as well as embarrassment (English man).